Welcome my 10th affiliate, Nerf Revolution! Nerf Revolution is a site that has it’s own forums for general Nerf talk, announcing of Nerf Wars, and of course theres the mod talk. Their probably the second most popular Nerf forum out there besides Nerf Haven. This kind community often takes time to help their noob members, and theres plenty of great Nerf mods to choose from on their site. I would also say that it’s more active then Nerf Haven. Thats right Folks, affiliate Hvz Auburn how has his own blogged called Shining Foam. He only has a couple of posts up, but there will most definitely be more to come. If you enjoyed his videos, be sure to keep an eye or two on his blog. My newest affiliate has been blogging since January 2011, and we’ve both take an eye to each other’s blog. It’s actually run by two authors, p13c30fch33s3 & Nerffan, and both live in Australia. They do lots of quality reviews and usage tips for their blasters. It’s filled with A LOT of Nerf info, and theres even stuff I haven’t check out there myself. So be sure to check out Nerf Blasters and Accessories soon! Nerf’s PR team has contacted me recently about all the leaked photos and video I’ve been posting recently. They have, very kindly I might add, asked me to take it down. I’m ok with this, since Nerf is a company a respect. If people want to have a mutual relationship, it often helps to have both people on the same page. They also send me free blasters, so I think the leak I could do is take down some posts. I know some of you will be disappointed in this, but I need to make some moves that help the blog in the long term. Introducing my newest affilate, S.O.F.T. 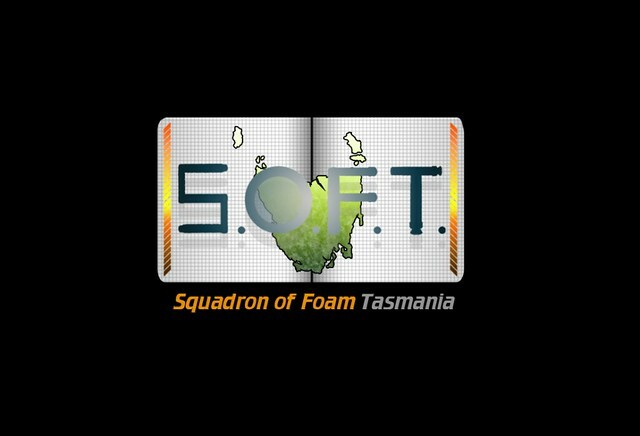 Squadron of Foam Tasmania (S.O.F.T.) is another Australian Nerf blogger who resides on the island of Tasmania. He only has a couple of blaster reviews up on his site at the moment, but he does good work and I can see him going places in the future. He also dabbles in photoshop & journalism, so check out S.O.F.T. here! How many HvZ events do you see or hear about in Southern California? Not much I bet. I went to last years event, and had a big blast. Check out my photo, video, and text recap here. They also had a Winter game last December, but I did not attend that. Camarillo is about an Hour and a Halfs drive from the LA Area, but the day long game is HIGHLY worth going to. In addition to the rare game of HvZ you can participate in, theres also the chance to meet new people and have fun. Heres their Facebook event description. Camarillo Humans vs. Zombies is back for the summer! This years event will be run by none other than David Casas and Christopher Nichols. The game will take place on july 20th and will feature a host of new game types and missions along with some interesting features designed to keep the game interesting even from the start, and no it does not involve super zombies. As we get closer to the date of the game we will be revealing a few changes that have been made in order to get you pumped up for this years event. As usual the event will take place at Mission oaks Park and the surrounding area, and we will have an official map of the playing field available for you by june. There will be no fee this year however we do ask that you consider making a donation to help cover any costs that are associated with running the game. You can donate any amount you feel willing to and any money collected over the cost of running the event will be donated to the “Make a Wish” foundation. This foundation is dedicated to making the wishes of children with crippling or incurable diseases come true and they are an incredible organization. So if you are able we do ask that you please consider donating. WIth that said i wish you all good luck and keep fighting those zombies. We will see you on the battlefield! I know July 20, 2012 is about 3 months away, but check out the event Facebook page! At the very least, keep it in mind as July comes closer. I’m not 100 percent sure I can go at this point, but if I do go, I plan on bringing a few friends.